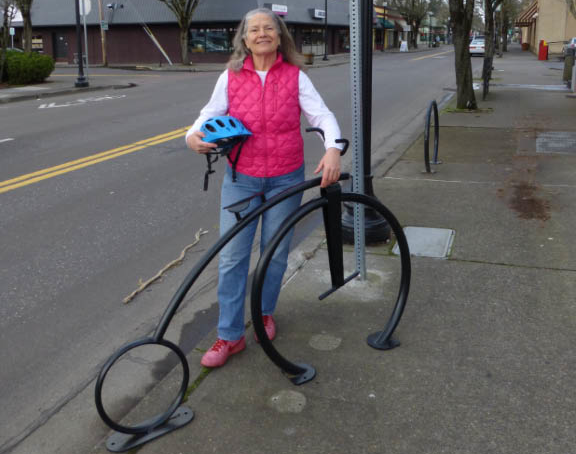 Carla Piluso is the sponsor of the first artistic bike rack. 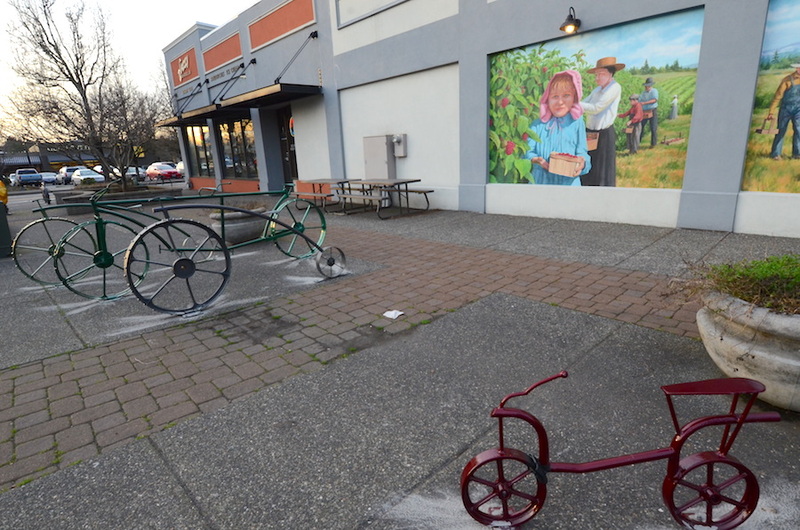 This bike rack has been placed near Jazzy Bagels on the corner of Main Ave and E Powell Blvd. 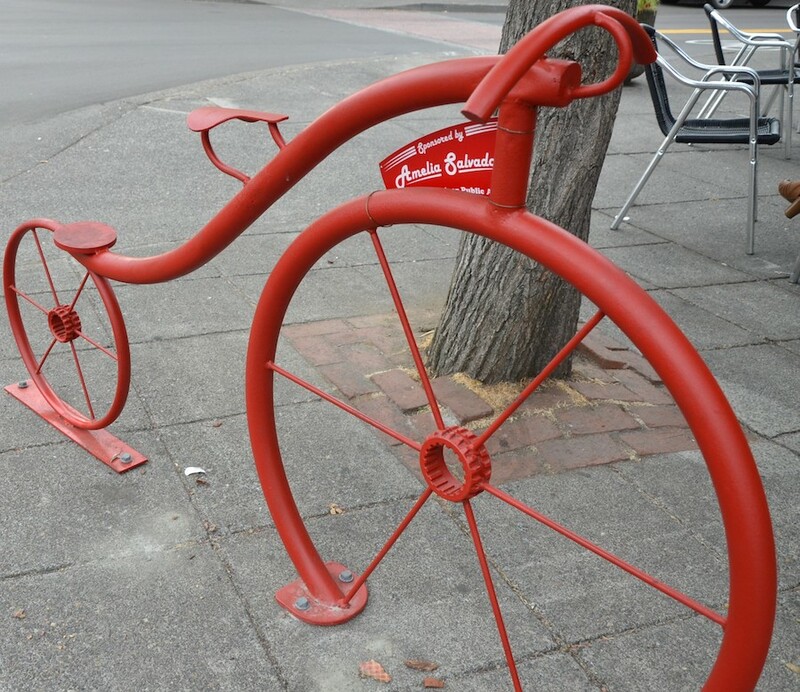 This bike rack was sponsored by Amelia Salvador and was placed on the corner of 3rd and Main by Cafe Delirium. 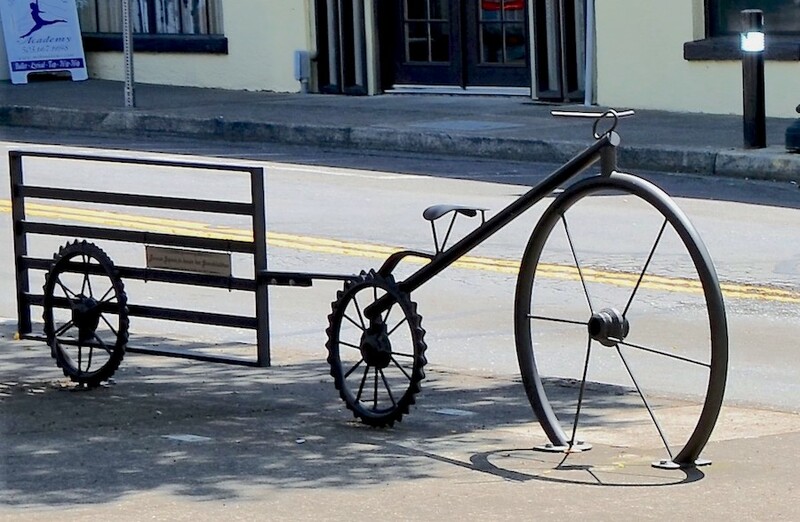 This bike was sponsored by Bonnie Jepsen to honor her grandchildren and was placed near the south side of the Gresham History Museum. 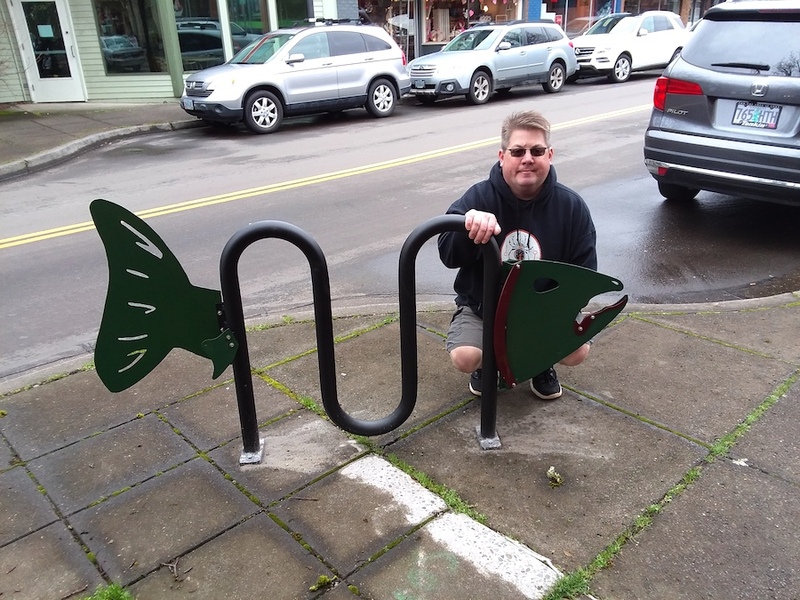 The salmon bike rack was supported by Frenzi's owners Kerri Ellis and Theresa Fery and was placed in front of Frenzi Frozen Yogurt on Main Avenue. Tim Foertsch poses with his creation. 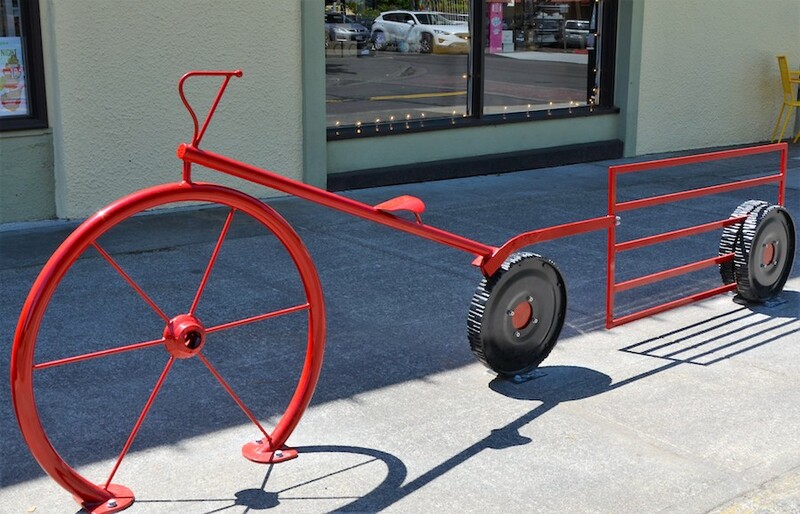 This cute red bike rack wagon sits on the north side of iCandy on 4th street. 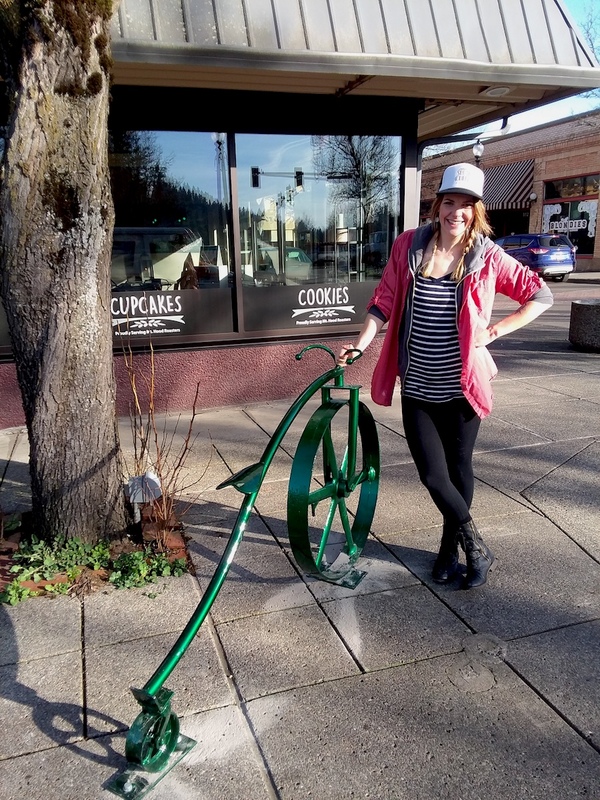 Kayla, owner of Sugar Cubed, poses with the new green bike rack on 1st and Main Ave.
Bike Farm on Powell in front of the farm murals and Jazzy Bagels. 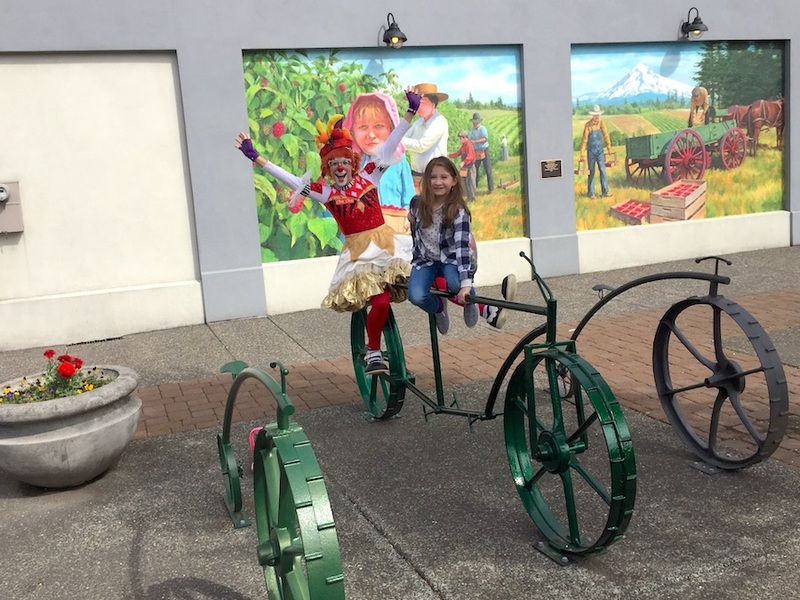 On May 8th, we celebrated the christening of the new bike farm made possible by a grant from Bicycle Tourism with support from the Gresham Chamber of Commerce, Gresham Outdoor Public Art, and the City of Gresham. Here are some excerpts and pictures from that day! 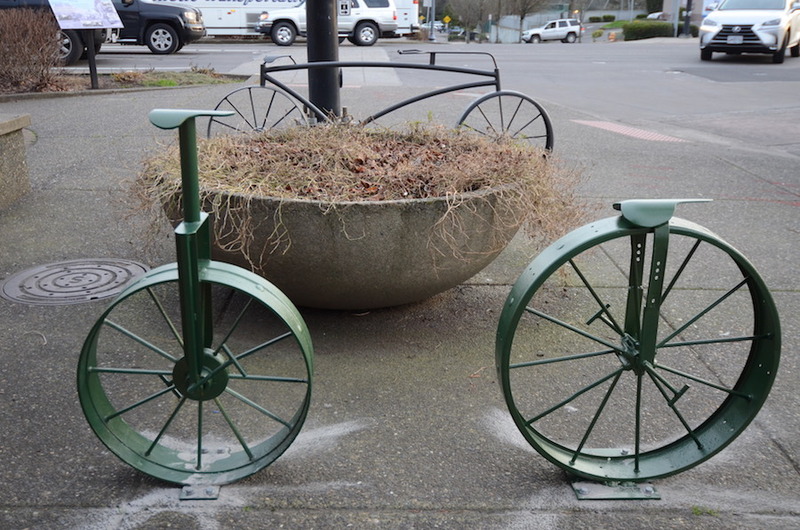 Gresham residents and visitors have a new way to connect up....their bikes. Made from re-used metals, these unique bike racks look like the antiques they once were. 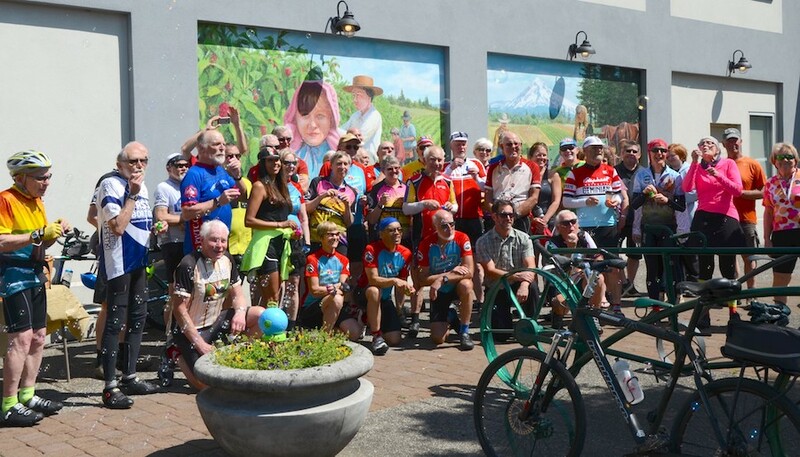 The PDX Wheelers bike club joined us that day! Tim Foertsch, who lives in Corbett with his wife and daughters, combed scrap piles, farmer’s fields, and estate sales to find the parts to build his creations. Tim’s idea from the start was to use every piece for something completely different and unique. Cha Cha the clown and kid playing on the new bike racks! 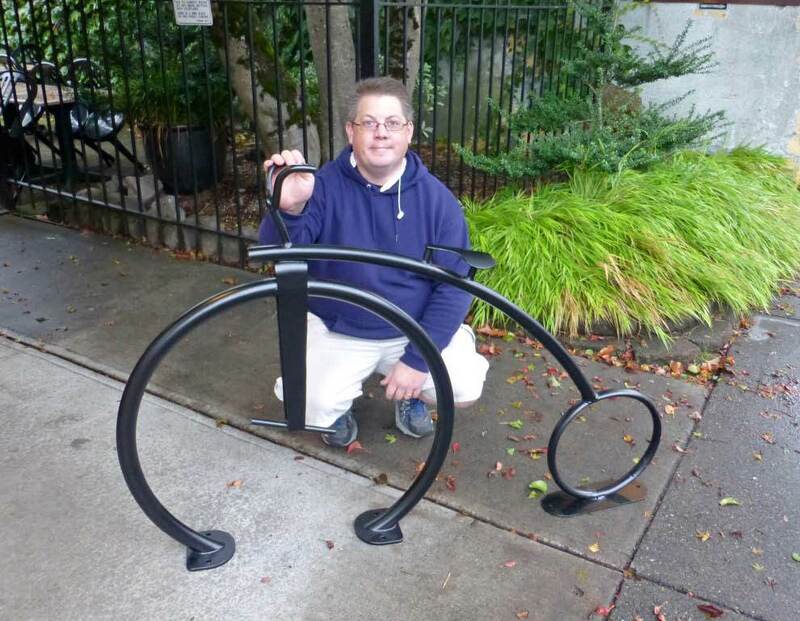 Tim Foertsch with his first bike rack creation. His raw material is typically found rusting in junk piles or fields near Tim’s home in Corbett. He and his wife moved to Corbett about 15 years ago to be near family and raise their two daughters. His day job is Telecommunications Engineer. Turning scrap metal into art, as more than a hobby, came after he visited a recycled art show. "It was a 'light bulb moment' as I realized I could make a little extra money doing what I enjoyed.” He introduced his work to the general public at Cracked Pots Recycled Art show at McMenamins Edgefield, Troutdale, in 2009. His first gallery show was in 2012. 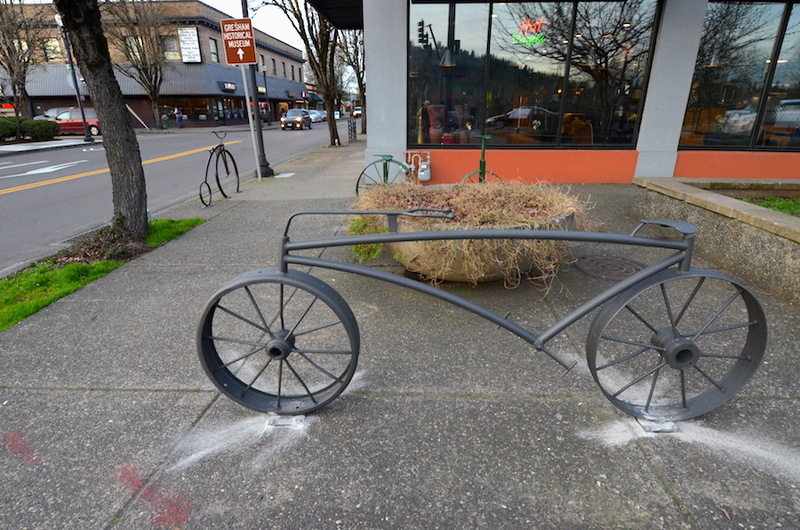 Bike racks are just a small slice of what Tim creates from the stuff many see as junk. Currently his art is available at Grizzly Ridge Upcycle, Sisters, OR; Off The Walls Gallery, Shelton, WA; and more. He has participated in the Vancouver, WA Recycled Arts Festival, the Portland Yard, Garden and Patio Show, Cracked Pots at Edgefield, and several other Northwest group shows. In 2012, his work was the winner of the People’s Choice Award on the Columbia Gorge Fall Foliage Tour. Tim’s website, haoleware.com, shows the range of his talents, from unique fire pits to creatures that can only live in the imagination. 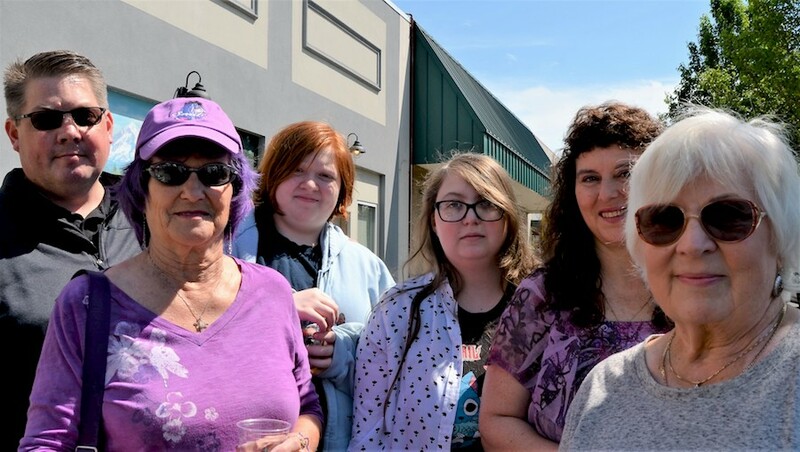 And for the first time in 2018, Tim has found time in his busy schedule to participate in the Annual Gresham Arts Festival, the third Saturday in July.